Spaghetti squash is often called, “vegetable spaghetti” because it’s hard, yellow shell hides slightly sweet, spaghetti-like strands inside. It’s part of the gourd family and is a winter squash although it is available year-round. It’s filling yet low in calories so it’s great for a satisfying meal. Try it topped with your favourite pasta sauce, cooled and tossed into a salad, or just sautéed with a little salt, pepper, butter and Parmesan cheese. Select a squash that is firm and free from soft spots, mold, bruising or cuts. They should also be generally heavy for their size with a thick, hard shell. Avoid tinged green squash as they may not be completely mature. Store unwrapped in a cool dark, dry place with good ventilation and it should last up to three weeks without deteriorating in quality. If you’ve got some leftover pieces that have been cut, they can be wrapped in plastic wrap and stored in the refrigerator. 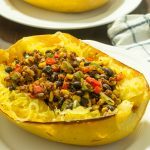 There are many ways to prepare spaghetti squash. 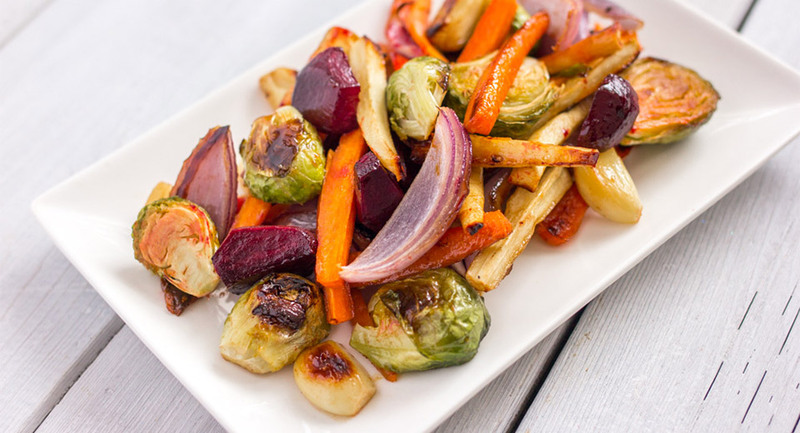 The most popular way is to bake it whole or halved in the oven. The fastest way to cook spaghetti squash is in the microwave. Microwaving spaghetti squash will yield a softer “pasta” with shorter strands, while baking squash will yield more of an al dente bite to the squash with longer strands. To Microwave Spaghetti Squash: Make sure that if you cook it whole (microwave or oven) you pierce the skin with a fork in several places to allow steam to escape. Cook on a microwave-safe dish for 10-20 minutes depending on the size of the squash. Smaller ones will take approximately 10 minutes, but bigger squash may take up to 20 minutes. After 10 minutes in the microwave, simply use a sharp knife to pierce the spaghetti squash to test how tender the squash is. Continue cooking at 2-3 minute intervals until done to your preference. Once cooked, remove, cut in half, scoop out seeds and use a fork to fluff and separate strands. To Roast Spaghetti Squash: Preheat oven to 400F, cut squash in half (instructions below). Scoop out seeds, brush a little olive oil on the cut sides and bake facedown for 30-45 minutes, depending on the size of the squash. Remove from oven once tender and use a fork to separate the strands from the squash. You can serve like spaghetti, or you can add other ingredients like cheese, herbs, garlic, salt, pasta sauce or other, and bake again in the squash shell until the cheese melts. To Boil Spaghetti Squash: Wipe down outside, cut in half, boil whole thing about 15 min. Then remove, drain and scoop out/discard seeds. Pull out strands and enjoy. To cut spaghetti squash in half, you’ll need a very sharp knife. First, slice off the stem, place the squash cut-side down (this will stabilize it) on your cutting board and press the knife down through the centre of the squash. To make a squash easier to slice in half, pierce the squash a few times and microwave it on high for 2 minutes. If you roast it whole (not cut it half), make sure you poke a few holes in it with a fork for the steam to escape or you just may end up with a squash explosion to clean up! 1 pound of squash yields about 1 ½ cup cooked spaghetti squash. The best cooking methods are to microwave and roast spaghetti squash. Microwaving spaghetti squash will yield a softer “pasta” with shorter strands, while baking squash will yield more of an al dente bite to the squash with longer strands. Check the doneness of squash by pressing on the skin. It should give slightly when the squash is tender and cooked. If you don’t have a sharp knife you can pierce the squash a few times, microwave it on high for 2 minutes. It will be easier to slice this way before roasting. 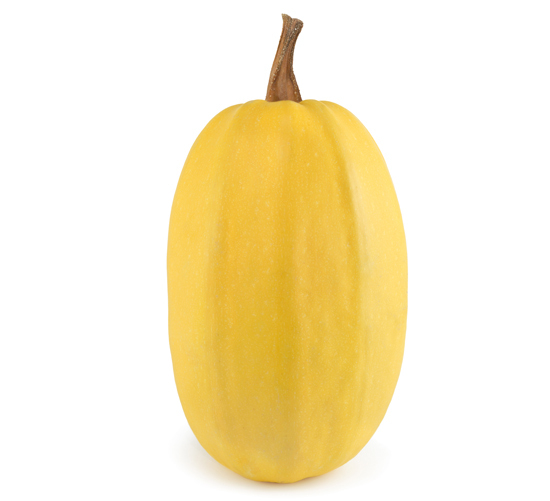 According to the Canadian Nutrient File, 100 g of spaghetti squash contains only 27 calories (compared to 158 calories of spaghetti pasta), 9% of iron, 7% of magnesium, 6% of zinc, 5% of phosphorus, and 5% of copper.